Falling isn't failing...unless you forgot to tie in. 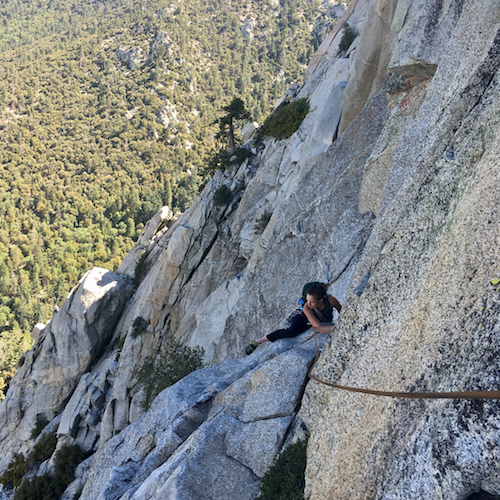 Touchstone's Heather Belgreen has a favorite piece of climbing advice and it came from a 10-year-old: "Falling isn't failing...unless you forgot to tie in," she said with as much wisdom and gravitas as her years could afford her. 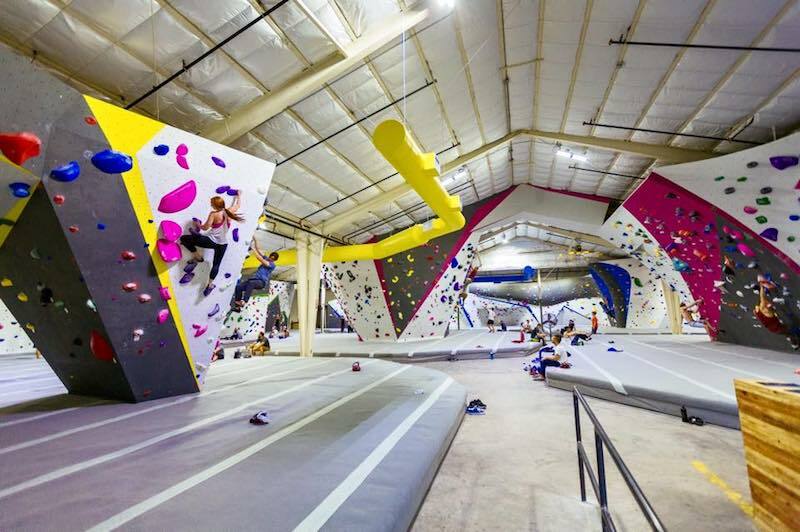 Once a more niche sport, bordering on extreme, climbing has found more mainstream success with indoor gyms like Touchstone, and is drawing fans that span generations. Touchstone Climbing was founded by Mark and Debra Melvin who met while climbing at Indian Rock in 1978. The first gym they opened was Mission Cliffs, which opened in 1995 in the vibrant Mission District of San Francisco. Within a month of opening the doors, climbers from all over the world flocked to the facility for the Sport Climbing National Championship competition. 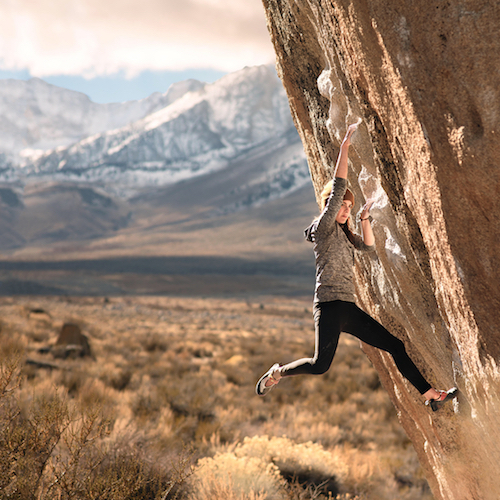 Since then, the Touchstone family has gotten a bit bigger—with 12 gyms stretching almost the entirety of California—but its goal of continuing to set the bar on what a climbing gym should be has stayed the same. "A strong sense of community is really important to us, and maintaining that community always comes first," said Belgreen. Stepping into a climbing gym you'll notice a few things immediately: enough Birkenstocks to keep the label in business, a higher than average amount of cuffed pants, and the bright, weirdly shaped holds that adorn the vertical walls. These holds make up the routes, which are known as problems. They're set by the Touchstone team of routesetters who climb all day and still probably dream about it at night. "Our routesetters have a passion for climbing and a strong technical or intuitive sense of climbing movement," Belgreen continued. "They're experts at dreaming up fun moves and know how to make those moves accessible to people of different strengths and body types. Sometimes a setter might create a problem around a particular move, or they might be inspired by a hold type, or maybe they want to set a trainer based on something outside." From conception to the first send, each route is put through the ringer by the whole team. "After bolting their initial concept, the whole crew goes through a process called 'forerunning'," where each setter tries every problem/route they can to give feedback, tweak a hold here or there, and come to a consensus grade where they try their best to deduce what most peoples' experience of a particular climb will be," Belgreen added. Each problem is then ranked on the V-Scale: VB being the easiest and progressively getting more difficult as the numbers get higher. The grades should be taken with a grain of salt though. 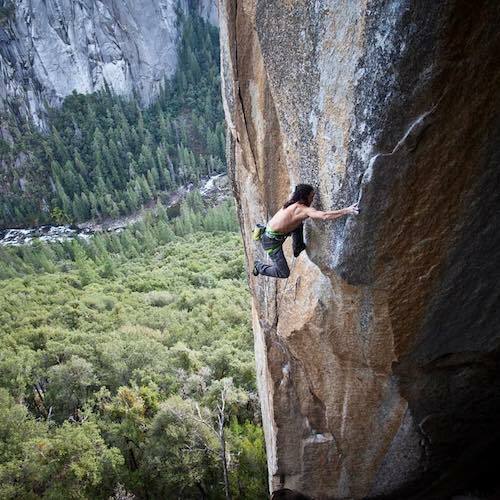 "All grading in climbing is subjective. At best, grades give you an idea of what to expect, but most climbers learn pretty quickly that grades at a particular area (or gym!) differ slightly from their own experience, and that's okay," Belgreen said. The routes are only a portion of what makes Touchstone what it is. 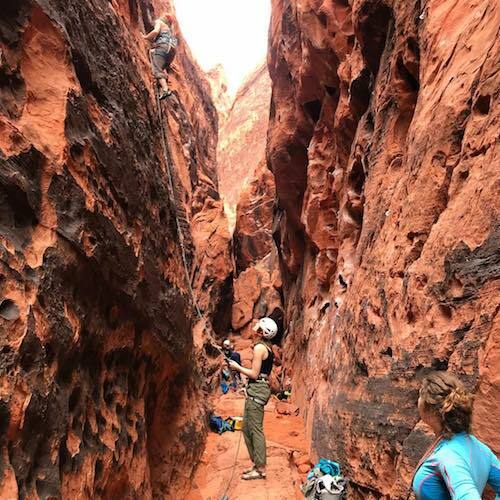 "Climbing is a much more diverse sport than people think, and we at Touchstone passionately believe that it should be accessible to everyone," Belgreen emphasized. "It's especially important that as our community grows, we validate and support a variety of goals and experiences. 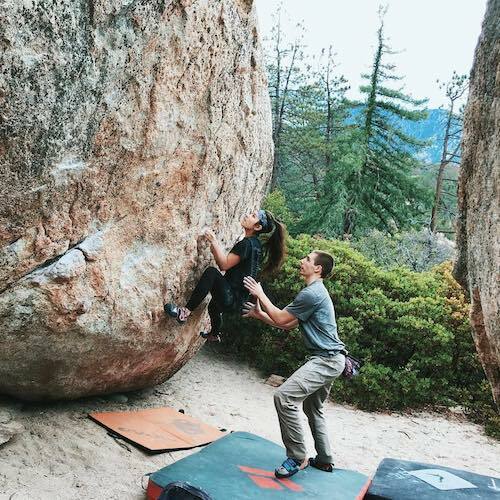 Climbing isn't just about 'sending the gnar,' and gyms aren't just training grounds for crag rats during rainy season. The reason this sport is so amazing is because of the friendships we form together, and an important part of expanding our communities is making sure our gyms are safe and inclusive spaces for everyone. Groups like Flash Foxy, Brown Girls Climb, BOC Crew, and Alpenglow Collective are all folks we try to work with as often as possible." 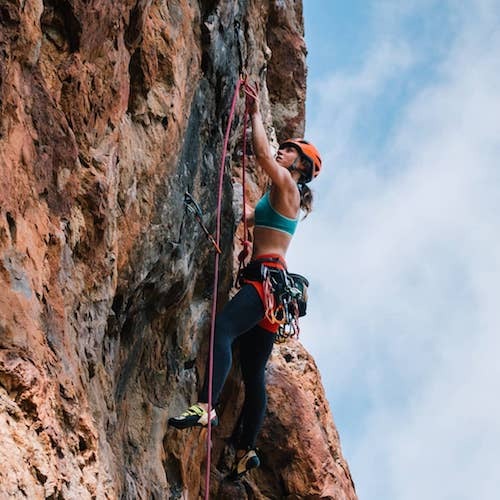 Luckily for us living in and around LA, we have a solid array of indoor and outdoor climbing options within reach. 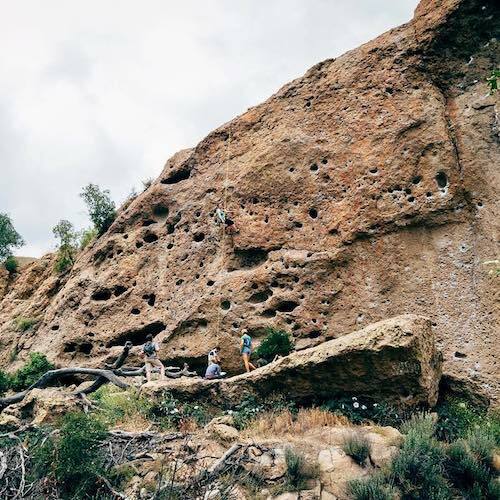 "Echo Cliffs and Malibu Creek State Park are local crags that have sport climbing and top roping with a variety of grades on offer," Belgreen said. 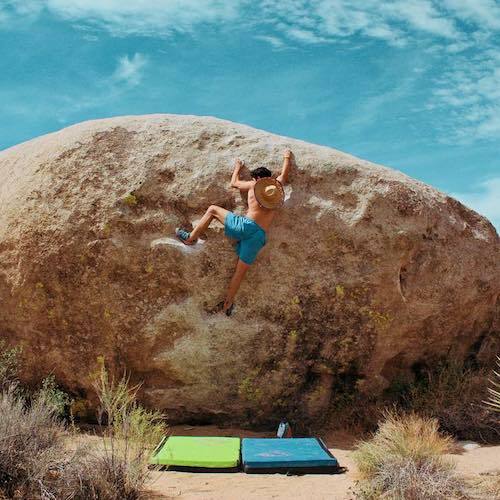 Horse Flats, Black Mountain, and Tramway are great bouldering areas; and Joshua Tree and Tahquitz have bouldering and trad. The Sierras (including Yosemite and Bishop) and Red Rock Canyon, Nevada have all forms of climbing and are close enough for a weekend trip. 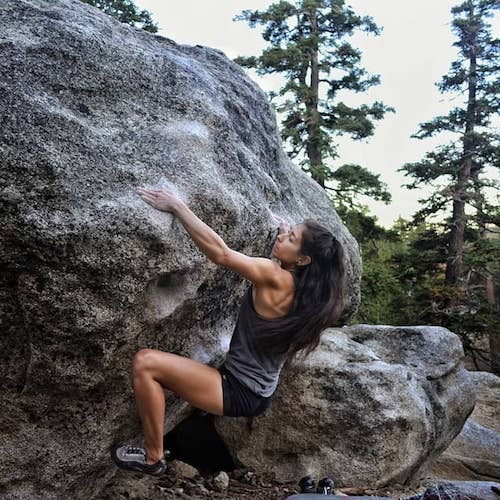 Every kind of climbing imaginable—trad, sport and bouldering—is available to LA folks ready to get after it outside!" 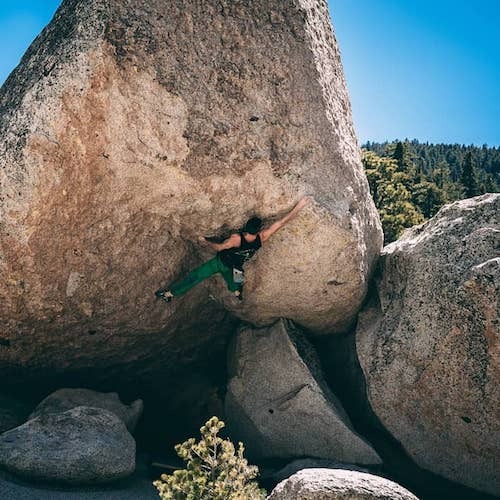 "For boulderers, check out Left Dihedral (V0) at the Chief Boulder and Saddle Traverse (V4) at the Saddle Boulders on Black Mountain," she added. "Sport climbers should hop on The Guillotine (5.10-) at Echo Cliffs, and Caffeine (5.11b) and Java (5.11d) are great too if you're looking for something a bit harder. While generally not super friendly for beginners, [Joshua Tree] does offer some good first trad leads like The Bong (5.4) on The Blob Rock and The Eye (5.4) at Cyclops Rock. Grab an area guidebook to get the best beta." "Before going outside, please remember that these lands are precious and fragile. All outdoor climbing is strictly Leave No Trace (i.e. everything you brought with you MUST be packed out, including ALL trash)," Belgreen concluded. "Leave the portable speakers at home, and check to see each area's policy on dogs before bringing yours. Make sure there aren't any closures for wildlife activity, and always check the weather first! Have fun out there, but most of all be responsible for yourself and respectful of others." If Spider-Man is your favorite superhero, then this place if for you, wall-crawler. Boasting a huge selection of climbing walls, some over forty feet high, the Cliffs of Id is a stellar place to stretch those calves. If heights aren’t your bag, they have other gym facilities like a yoga studio and weight room. Is an expensive one, but within hiking distance to some really cool areas such as the M*A*S*H filming location site. A rugged area in the Santa Monica Mountains that was once home to the Chumash tribe, Malibu Creek State Park is now known more so as the filming location for M*A*S*H and Planet of the Apes. With over 8,000 acres to explore, extensive hiking trails and a rock pool swimming hole, it’s also nicknamed SoCal’s Yosemite. Iconic national park offers an array of options such as hiking among redwoods & river rafting.